We are a premier manufacturer of innovative aluminum boats where quality and craftsmanship come first. We invite you to explore our site and check out the beauty of our boats. Below and elsewhere in this site you'll read information that will ensure you receive long-lasting value when buying your aluminum boat. We are able to create extraordinary designs because we do all the designing, lofting, and parts nesting in house using a program called Rhino (see www.rhino3d.com). We have created a direct real time link between the person building the boats and the person designing it. This link gives us a greater understanding of what we can and cannot do -- such as just how much to curve to put in our hulls to give them the best ride while still being able to build the boat. At Ironwood Boats, we have the expertise and knowledge of over 20 years experience to provide you with the best advice in building your boat. 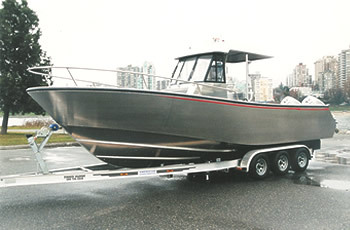 As well, the beauty and functionality of our SALTWATER SERIES design is unrivaled among aluminum boats. To see what we mean, we welcome you to come and take a look for yourself! No other aluminum boat builder has taken on building a tough, beautiful and seaworthy aluminum boat like we have.